The term ‘Industrial Wedding’ may seem a bit off-putting, but as a starting point for a city wedding it’s a great idea, giving you the opportunity in explore some amazing spaces in which to hold your wedding. Warehouses, old mills, Victorian factories can offer a unique and in some cases awe-inspiring space in which to plan your celebration. The vibe is bound to be relaxed, with concrete floors, ironwork and exposed brick or plaster providing the pared-back canvas for interesting lighting, bright floral displays and quirky details. In this setting you can push the boundaries of wedding dress design and choose something very individual. 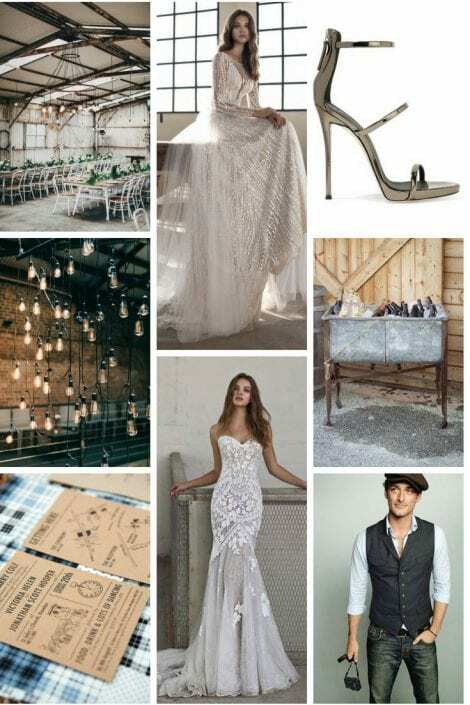 Bridal designers Modeca have chosen to photograph their new collection in a warehouse setting, and they look just great! For more inspiration look at our Pinterest board.